Brought to you by the fine people at Intuit, a quality website builder in its own right, Homstead.com is a stripped-down, miniaturized but still capable website builder designed to get you and your Internet effort up and running quickly. The good news? Whether you have a blog to create or a store to establish, Homestead should be able to accommodate you at a low price, which is more than some website builders can say. But if I told you the good news, that means I’ve got bad news: with a few exceptions, Homestead is just not any better than the plethora of website builders out there. Yes, it has a free trial you’ll want to give a try if simply to experience the web site for yourself. Go ahead, prove me wrong. But this Homestead review intends on giving you the straight facts – the good and the bad – about this Intuit-published website builder. Homestead? Why Not Just Use Intuit? Considering Homestead and Intuit will both run you about 5 bucks a month after you end their free trials, there’s one simple hurdle I can’t get past: why does Intuit even publish Homestead? Sure, Intuit is built and geared for small business owners who like features like online payroll and setting up stores, but Homestead is similar enough that there are more than just a few redundancies. Maybe Homestead is simply Intuit’s answer to other website solutions like Weebly or Site Build It, but there must be more to the story. We bring this up because not everything is as hunky-dory in the world of Homestead as it is over at the Intuit flagship. The designs and templates present at Homestead are nothing to write home about, and the features – though comprehensive – don’t excite you like the ones over at Intuit. It’s quite the head-scratcher. The solution is to review Homestead and forget that Intuit exists. Once we do this, we see it is actually a worthy entry into the world of Weebly’s and Jimdo’s. Just remember that the free trial runs up! There are two main strengths to Homestead’s overall offer, which we’ll address here: price and features. Let’s take a look at each. As we stated before, you start out your Homestead experience with a free trial, which actually better resembles a “first month free” offer. If you don’t sign out of the free trial after a month, then you’re on the hook for $4.99 in proceeding months. It’s not a bad way to get people to sign up and, hey, if you can’t remember to cancel an account after a free trial then you probably deserve to be billed that $4.99. What Will You Get in the Features? This is where Homestead makes up the most ground. A simple browsing of their features yields important information. You can use your own domain name, have your own email address, employ analytics, add a blog, accept payments through PayPal – the whole shebang. While it’s not quite as sophisticated as its parent sitebuilder, Intuit, it’s still a capable website builder in its own right. Other sites might make you pay more for the full gamut of features, so Homestead’s flat-price option at least keeps things simple. And you always know what you’re getting. Admittedly, Homestead is better tailored to a less advanced audience than is Intuit. Intuit allows for a legitimate small business presence online; Homestead is more like pitching a tent and camping out online. Not that there’s anything wrong with that, and heck – if you’re someone who wants to get started off simple, Homestead is exactly the type of sitebuilder you’ve been waiting for. Because you’re not on the hook for the first thirty days, you’ll be able to explore all of the features Homestead has to offer without a credit commitment. This gives you the freedom to take your time in selecting from a lot of templates – though don’t expect Homestead to reinvent the design wheel for you – and upload your own images and logos while integrating a store or blog. Depending on your ultimate goals, Homestead should be able to suit your Internet skills pretty admirably. And yes, that’s a fancy way of saying it’s a great “Internet for dummies” site. The Big Question: Do I Recommend It? As good as I’ve made Homestead sound, there’s still one big complaint I have: Homestead doesn’t really have a strong identity. If it’s for small businesses, why charge as much as a superior service like Intuit? If it’s for the simple crowd, wouldn’t you be better off paying nothing at a quality site like Yola or Weebly? It sounds like a rhetorical question, but it’s one you’ll really want to ask yourself. 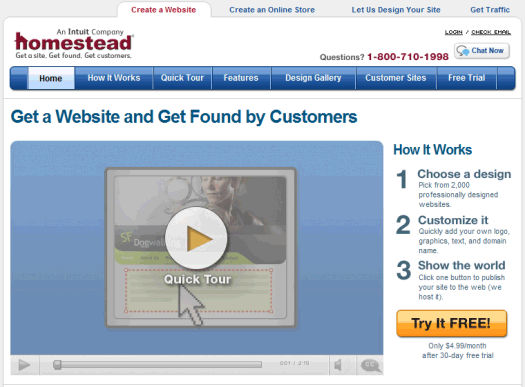 Because depending on your goals, there’s a good chance you won’t find that Homestead is the right sitebuilder for you. Unfortunately it’s got some excellent features and a simple pricing system that don’t really seem to fit the intended market. I know: $4.99 a month isn’t exactly steep, but it’s $4.99 per month more than you should be paying if you really know what you’re doing. If you want to follow this Homestead review’s recommendation, give the free trial a good testing out. You may find that Homestead’s quality features are easier to use than the ones you find at another site. Heck, you don’t have to listen to me. But if you only want to sign up for one website builder today, keep browsing Clickfire for a review of one of the superior sitebuilders. After all, if Homestead is not the best website builder you can find, that’s probably just good news. I take up your challenge Dan, risking your scorn at my code kitten simpleton ways. -The templates are optional. Building from scratch, adding code, etc is just as easy & much less painful than having to reinvent the wheel over and over again. -One support contact for everything; site building, hosting, domains, emails. (Prevents passing the buck). -Excellent customer service via phone and live chat. -No worries about updating this theme, or that plugin, or why it looks bad on an iPad; cause they handle that. -Extremely secure hosting. I have over 10 sites with them, and not a hacked one in the bunch. email spam zero. (I will not bring up WordPress at this point). -No matter how much time & money you spend on a website if you don’t market it..no one will see it anyway. So get it done and then be strategic on getting it out of the gate.